When I saw Sum 41 finally release a new music video Goddamn I’m Dead Again on Youtube last year, I freaked out, because I’ve spent years waiting for new songs since their last album Screaming Bloody Murder in 2011. This punk rock band finally comes back and shows the world how genuinely that they come back ‘for everything back and more’ (“War”). 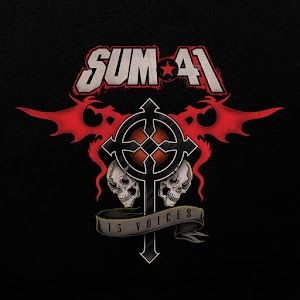 Their latest album 13 Voices definitely exceeds my expectation as they rock even harder than before with subliminal lyrics inspired by vocalist Deryck Whibley’s near-death experience due to alcoholism. As the opening song for this retrospective and awakening album, A Murder of Crows begins with an unsettlingly somber tone with the high pitch violin preparing and drawing the audience deeper into the consciousness of the Deryck’s mind. And the two whole minutes of killer guitar solo on the next song Goddamn I’m Dead Again turns out to be the grandest introduction to the miracle guitarist ‘Brownsound’ Dave’s return. That sudden burst of twisting intensity and bullet-fast riffing makes it even more exhilarating as if an epic boss fight in an action type video game. Fake My Own Death‘s bouncy upbeat chorus and metallic riff just fills up the song with continuous thrills in the album while Breaking The Chain’s rhythm merges perfectly and successfully to surprise listeners with another refreshing taste of Sum 41’s experimental musical element with their original punk rock style. The stomping bass rhythm in There Will Be Blood following by that Tim-Burton-plus-Quentin-Tarantino inspired song 13 Voices sets out the final protest to the singer’s past and perpetuate our throbbing heart beats. Half way through the album, War easily conveys the singer-song writer’s reckoning moments and it becomes the turning point of the album both spiritually and emotionally. War carries the darkest but also the most hopeful messages with that raspy vocal and echoic determination navigating an emotional journey from resentful enmity towards assertive self-salvation (like “God Save Us All (Death To POP)”) and later acceptance. It is currently one of my favorites from this album. Meanwhile the steadfast guitar riff in The Fall And The Rise reinforces its strength and confidence to never back down from adversity and resolves in a humble realization in the last song Twisted By Design. 13 Voices is undoubtedly a powerful comeback from Sum 41. It is a psychological documentary and also an inspirational album to whomever is going through difficulties in life. In addition to the new member; drummer Frank Zummo who has been nominated for Best Drummer in 2017’s APMA, there is just no reason to miss out such awesome album no matter if you are a long-time fan of Sum 41 or a new listener. This album is available at iTunes & Spotify.